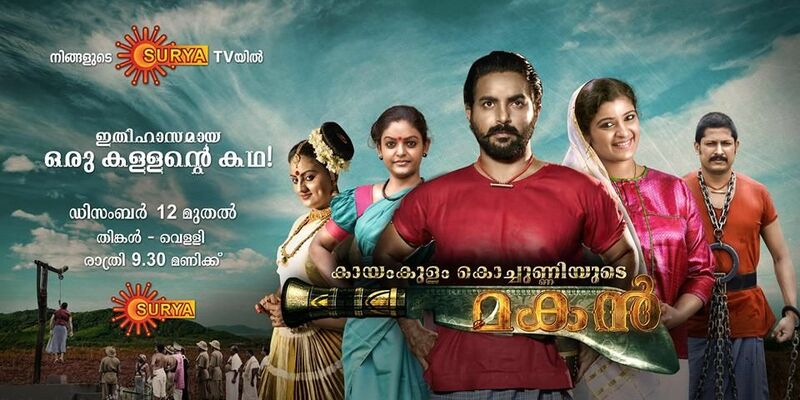 Leading malayalam channel surya tv announced the launch of a new serial named kayamakulam kochunniyude makan. surya tv will air this serial from next monday, 12th december 2016 at 9.30 p.m. kayamkulam kochunni was one of the successful serial on surya tv, which aired around 751 episodes. we can say this will be the squeal to kayamkulam kochunni serial. this serial will tell the story of sulthan, he is the son of kayamkulam kochunni. every monday to friday at 9.3p p.m is the telecast time of kaayamkulam kochunniyude makan surya tv serial. popular tv artists are appearing in this serial, we can check the cast and crew of kochunniyude makan. Manikkuttan played the childhood role of kayamkulam kochunni. It’s second part will tell his son story, sulthan is the name. it’s directed by M Padmakumar and Written by GS Anil. Askar Ameer, Shalu Kurian, Premi Viswanath, Hareesh Peradi, Anoop Chandran, Sree raman, Sasi Kalimga, Mohanraj (keerikkadan jose), Anand, Nia, Idavela babu, prakash etc are in the star cast. Karutha muthu fame premi viswanath and shalu kurian are the heroines of kochunniyude makan serial. Sahayathrika serial will windup this week. There will be changes in surya tv schedule next week.